The period covered initially by Arts:Search is 1896-1910. Available soon. Monthly. Launched in 1896 as The Architectural Review for the Artist and Craftsman by Percy Hastings, owner of the Architectural Press. 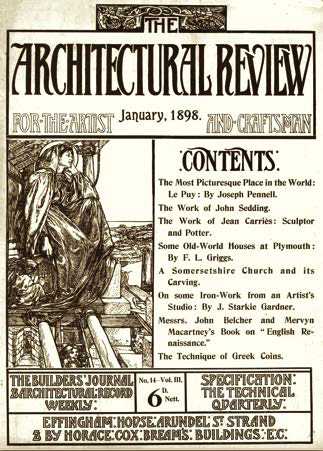 The Architectural Review is the longest-running and one of the most respected British architectural journals. During the period initially covered by Arts: Search (1896-1910), the focus of the journal was very much on the then prevailing Arts and Crafts style. Contains articles on domestic, commercial, industrial and civic architecture; as well as articles on stained glass; furniture; architectural sculpture; interior decoration, art metalwork; garden design, etc. Architects, designers and craftspeople whose work is discussed and illustrated include C.F.A. Voysey, C.R. Ashbee, M.H. Baillie Scott, and Christopher Whall.